Dr. H’s instinct that day was correct, I’m relieved to report. But, honestly, it didn’t mitigate the damage already inflicted by the stress of knowing he *may* have cancer — and if he did, what was the prognosis? When she called that day, it was only to confirm the biopsy results showed cancer. But she was counting on her gut that the cancer had not spread. After that call, the thought: “How much can a person endure?” was an unspoken, but heavy presence in our household. After all, this is the fifth time in Joe’s life that he’s been told he has cancer. (One was a false alarm.) Doctors have said to him more than once: “Settle your affairs; you’ve had a good life.” The first time was more than 50 years ago. As most of you know, Joe has spent the past year in and out of the hospital. There are numerous reasons – some serious, some minor, but most occurring simultaneously. Unexpectedly, in mid-December 2015, Joe was admitted to the hospital. He exhibited symptoms of pancreatic cancer. (Thankfully, we found out a week later, that it was a misdiagnosis.) He had a procedure which went awry and was admitted to the hospital again on New Year’s eve. Among other alarming diagnoses in the ER, cardiologists determined that he’d had a heart attack. He was admitted to the ICU. We learned two weeks later that he did not have a heart attack; however, due to infection, his heart was “working overtime.” An angiogram revealed there was little damage to the heart. In mid-January, Joe recovered enough to be released from the hospital. He received nutrition through an IV for six more weeks and began with pureed foods in February. This was the first food he’d tasted since early December. His recovery proved to be an extended uphill climb. For the better part of 2016, Joe and his wife have been focused on his health and recovery. We cannot thank you enough for your continued generosity. Joe would never have gotten the attention he needed without your care and support. 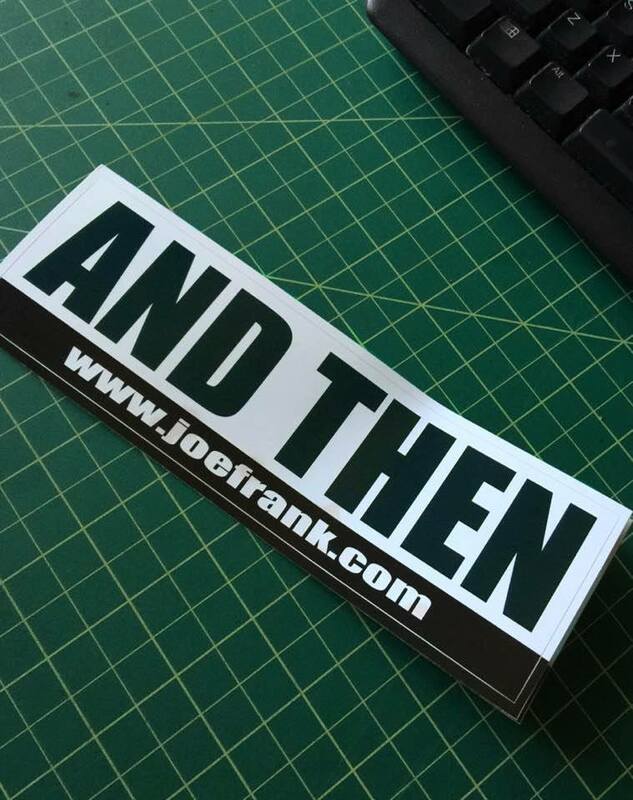 If our emails have gone to your spam folder and you would like a reward, please email joefrankfund@gmail.com and we’ll get it done. As many of you know by now, my husband, Joe Frank, became ill in mid-December. Many have asked “What exactly is wrong? What illness does he have?” As this time, it’s impossible to answer that question conclusively. Throughout his life Joe has suffered from multiple health problems, including kidney failure, cancer (testicular, bladder and colon, with attendant major surgeries and chemo and radiation), and intestinal blockages and serial infections that required hospitalizations. During Joe’s latest hospitalization a heart problem was discovered and we’ve been told that Joe might have experienced a heart attack. Joe’s health has been under siege for as long as I’ve known him. And because his immune system is suppressed due to the anti-rejection medications he takes for his kidney transplant, Joe is even more vulnerable to illness. What on Monday, December 14, appeared to be a slight yellow cast to his skin became by Friday, a disturbing deep mustard color. After several blood and other tests administered throughout the week, on Friday December 18, Joe was admitted to the hospital. We were told that it was the only way to accelerate additional tests required in order to identify the cause of the jaundice. After several days, the doctors disclosed their concern: pancreatic cancer. A tumor could be closing off at least one liver bile duct, which caused the jaundice. To definitively determine whether a pancreatic tumor was present required placing a camera scope down into the duodenum to examine the pancreas. During the procedure, however, the scope flipped and tore the duodenum. The doctor quickly aborted the procedure and clamped the tear. Two hours after the procedure, I was called into the recovery room. From my prior experience with Joe’s procedures and surgeries, when I was called into the recovery room, I would rejoin Joe as he was waking up. Then the doctor would come in and talk to both of us about what the results were. This time, the nurse guided me to an empty room where I was told the doctors would see me shortly. After 15 very long minutes, the doctors came in and were jubilant. No cancer – no tumors found anywhere! In fact, the cause of the bile duct obstruction was likely due to a stone that had lodged there – and had been present possibly for years. Once they opened the duct, sludge poured out. That, they determined, had been the cause of the jaundice. Joe spent that evening in the hospital to ensure his blood and other tests remained normal, and he returned home the following day, December 30th. That night, Joe was not feeling well but had only a slightly elevated temperature so we did not call the doctors. In the early morning hours of December 31st, however, Joe started to feel abnormally weak, and later that day began to exhibit alarming symptoms (vomiting and losing consciousness), which left no choice but to return to the ER. We arrived in the early evening of New Year’s Eve. Hours later, with results of numerous tests in hand, the ER doctor declared to Joe: “You are very, very, very sick – and likely have sepsis.” Joe was admitted to the ICU at about 1:00 am, where he was closely monitored. After several days of treatment and discussions of various types of surgery for a possible obstruction, and an angiogram to place a stent in the heart, the doctors made it clear that Joe’s recovery would take months and that he would remain on clear liquids for a minimum of a week after returning home. We would be able to introduce non-residue fibrous, overcooked and pureed foods (with liquids added) only as Joe was able to tolerate them. He returned home on January 15th, unable to walk, unable to eat and feeling extremely weak. He had not had a normal meal since December 17th. After a week of the clear liquids, we pureed some spinach and carrots and added them to a light vegetable broth. We were hoping that as he was fully able to tolerate these types of foods, we would be able to introduce soft foods – creamier soups, banana smoothies, jello, and even rice. The idea is to slowly and gradually move off of the TPN, while simultaneously return to having food orally. This process generally takes a month to six weeks. However, Joe is not tolerating even the slightest pureed food. Regarding his heart: The angiogram showed no blockage, so a stent was not required. The cardiologist and other doctors involved in Joe’s case theorized that the tachycardia and other indicators of heart attack may have been due to the stress placed on the heart because of the infections and the blockage he had on New Year’s Eve. However, they put him on two new medications for his heart and will monitor him closely over the next six months. Physically, Joe is just starting to walk once or twice a day in our apartment with a walker. A physical therapist will start coming twice a week to help Joe with exercises to regain his strength. We’ve bought a portable wheelchair (to fit into the car for doctors’ appointments which start next week) and ordered a new full-sized wheelchair for around the house. We have emailed people who contributed to the campaign between January 12 through January 27th regarding their rewards – please check your spam folder if you have not received our email, or contact us. We email reward information on a weekly basis. Those who have contributed from the Jan 28th through Feb 4th should receive an email on Feb 5th. See “Description” on the Go Fund Me page for background. All orders this month are 5% off! The discount will be applied in the shopping cart on checkout. (Note: The discount does not include Membership). If you’d like to give the gift of a Joe Frank letter be sure to order early and include in your order notes a little about the person who will receive the letter – personal interests, passion, memories, etc. Joe writes each letter for recipients – each one is unique and one-of-a-kind, and handwritten by Joe. Be sure to check out our recommendations for Joe Frank shows to enjoy for the holidays. A special favorite is the 90 minute At the Dark End of the Bar - perfect for New Year’s Eve. Welcome WDBX in Carbondale, Illinois! Tune in for weekly Joe Frank shows to be set in the coming month. We are planning to mount a live show in the spring at Cinefamily’s Silent Movie Theater in Los Angeles. Stay tuned. And, Joe is also working on new material for KCRW’s Unfictional. If you missed any of Joe’s Unfictional shows, you can download each of them here. The misery of elaborate Thanksgiving dinners; an examination of American Pilgrims. The idea of religious pilgrimage leads to a car trip across America. In 1989, Joe wrote, produced and performed this solo 90-minute show at MOCA. In the early 1990s, at the request of his agent at ICM, Joe recorded a compilation of voices for animation. The agent rejected it outright. Joe voiceover work for Saturn spots in the 1990s. We just discovered this one: Joe Frank raising funds for his show on KCRW in his inimitable way. Four Jiffy Lube spots Joe narrated in the 1990s. Longtime friend, Larry Josephson, introduces Joe at the 2003 Third Coast Audio Festival Lifetime Achievement Award ceremony.